We were appointed by Talbot Green Development Ltd to prepare a masterplan, Design and Access Statement and Landscape Visual Impact Assessment to support a planning application for 460 dwellings on a strategic site. The vision for the development is to provide a new neighbourhood within a generous amount of green space, retaining existing trees and using existing hedgerow corridors. Developing an appropriate interface between housing and the natural site setting of Cefn Yr Hendy has driven decisions at all stages of the design process. The aspiration has been to ensure a positive visual relationship, where the development makes efficient use of space for well needed housing but equally is not overly urban or imposing on elements of the site which has a rural character. The Design and Access Statement we produced outlines how the design approach has focused an appropriate development character defined by a landscape-led masterplan. an appropriate interface between housing and the natural site setting. The proposed masterplan for the 19.8 hectare site is a mix of residential, open space and structural vegetation. The proposals include the provision of easy access to a new single form entry primary school and retail use, benefiting not only the proposed community but also existing neighbourhood. The proposed residential area is split into differing character areas and is proposed to comprise of 460 dwellings. 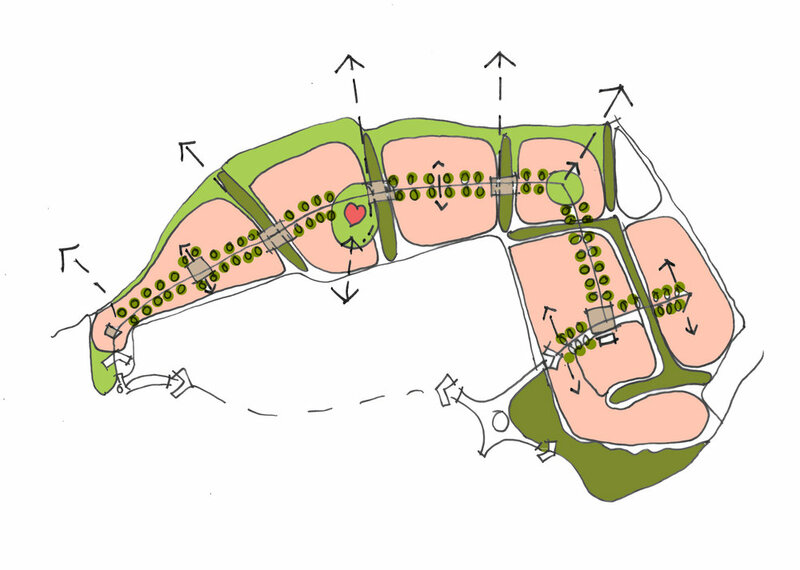 Areas of green space are located centrally and to the perimeter of the residential areas. A number of footpaths are proposed through the strategic green space, including a retained public footpath which currently passes through the site.